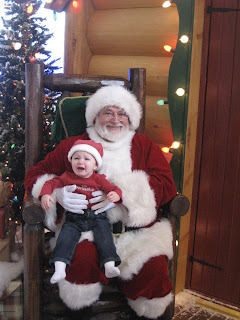 Now don't be confused by my title, my daughter doesn't actually hate Santa. She just hates sitting on his lap and having her picture taken with him. 2010-You can't make me sit on his lap!! Fine I'll stay in your arms, but I keeping far away from him. These pictures crack me up!!!!! Mark and Molly think Santa is pretty cool so far. Want to link up and join our Santa party? Then join Tonya from Letters For Lucas and Natalie at Mommy of a Monster & Twins and linking up your 2011 Photos with Santa! My Meg was the same way. 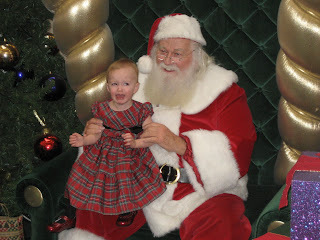 I think she still has some of that trauma from the first time we tried a Santa pic left in her brain somewhere. Aw. It's still a cute picture. Thanks for linking up and happy holidays! The 2010 photo is just classic. Love them all - what a cutie! That is totally hilarious! She's making progress though! Next year is her year!